Cheese, glorious cheese! 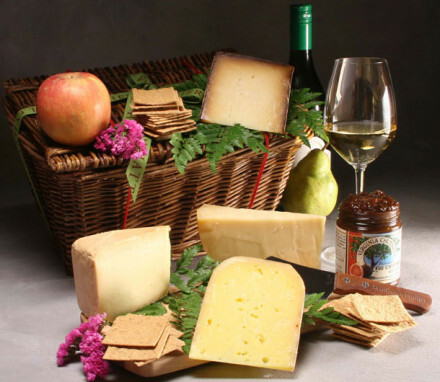 We have paired award-winning cheeses -- cow, sheep and goat -- from farms in the Northeast with sweet and savory accoutrements -- fresh and dried fruit, fig paste, crackers, nuts and meats. 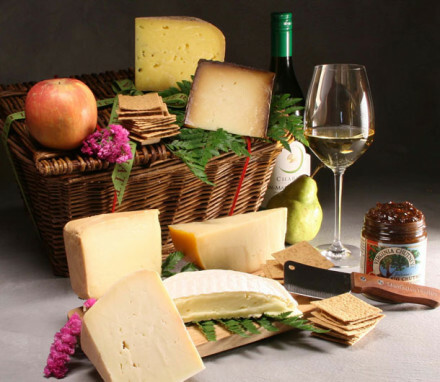 Our gourmet cheese gift baskets include award-winning cheeses from some of the best farms in the Northeast. 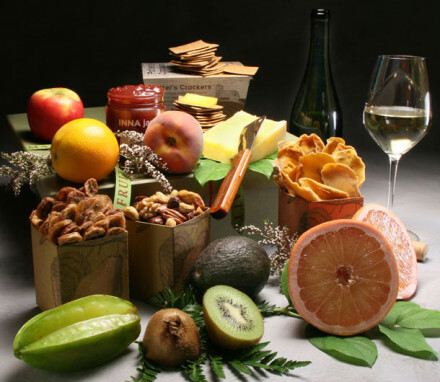 We then pair these savory cheeses with a variety of different natural delights including fresh fruit, dried fruit, crackers, nuts, and artisanal meats. 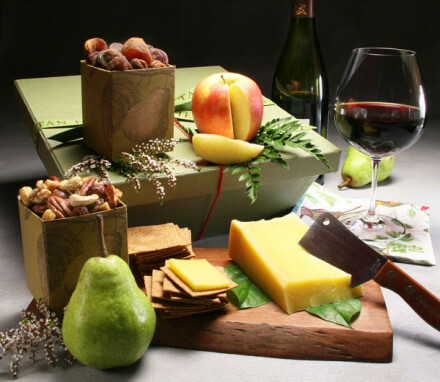 We always add a cheese knife so that our gourmet cheese gifts arrive ready for a picnic in the park. Grab friends, family, and a bottle of wine for the ultimate cheese and wine picnic. Our gourmet cheese baskets come in a variety of sizes, perfect for sharing with close friends or a large group. 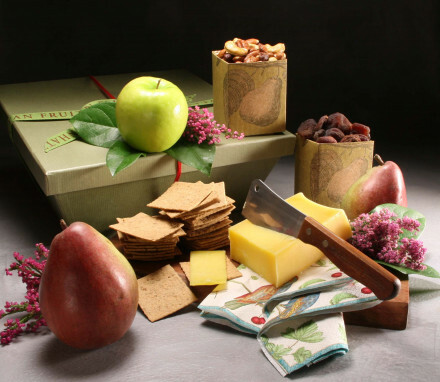 Our smaller cheese and fruit baskets feature fruit, crackers, and an iconic cheddar cheese from Vermont. This is a perfect gift for one or two people to enjoy. Our larger cheese gift baskets include three or four carefully-selected gourmet cheeses including an exemplar cow, sheep, and goat milk cheese. 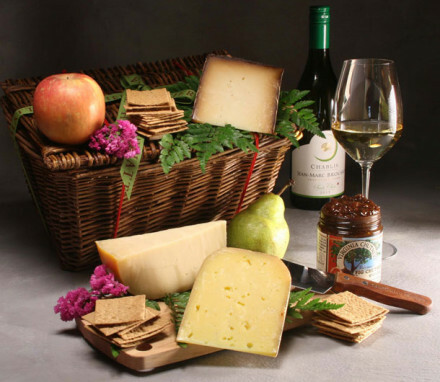 If organic is what you are looking for, consider our organic cheese and cracker basket. The star is the organic cow milk cheese which we compliment with organic mixed nuts, organic crackers, and organic dried apricots. 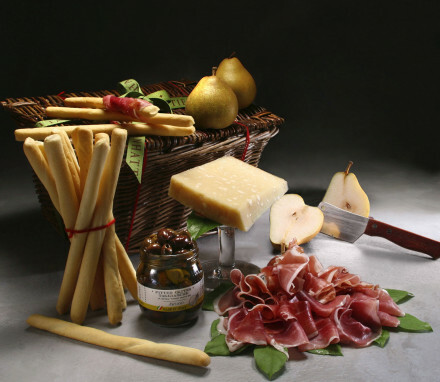 One of our prized cheeses does not come from the Northeast, but rather from Italy --- Parma, Italy to be exact! Our cheese and meat gift basket marries this authentic Parmigiano-Reggiano with an acclaimed, melt-in-your mouth prosciutto for an unparalleled taste combination. With breadsticks, olives and seasonal fruit pairings, this cheese and meat basket is a veritable Italian antipasto treat. Our entire line of gourmet cheese baskets are ideal for picnics or hors d’oeurves, or hostess gifts to bring to a dinner party or weekend visit, or afterward as a thoughtful way to say Thank You. There is no need to go out to the cheese shop when you need a gift for a special occasion; your cheese gift box will be delivered straight to your door.